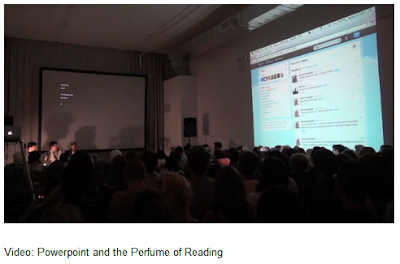 In response to several recent comments on the SHARP listserv regarding book-scented perfumes , Ellen Garvey posted a link to Tan Lin's screening/discussion, "Powerpoint and the Perfume of Reading." The actually screening of Lin's piece -- which takes up the first twenty minutes or so of the video -- is hard to follow. Some of the text is illegible, since you're watching a film of a film happening in the room in which the screen is angled away from the camera and takes up less than half of the shot. More interestingly, the most innovative aspect of the piece, to me at least, is cut off from us Vimeo viewers: the perfume "soundtrack" pumped into the room to accompany the piece. What does a Powerpoint-inspired bibliographic e-poem smell like? The perfumes are not described during the discussion, so I'm left to imagine what they might be. I smell institutional libraries -- the off-gassing of industrial carpeting, and the humid metallic smells of concrete staircases locked behind fire doors. Strangely, I don't smell any paper. Libraries don't smell much like paper to me. Books in libraries are closed, and the thing about books -- the thing that makes them so olfactorily intimate -- is that they don't disclose their scent until opened up and brought close to the face. You really have to bury your nose in a book to smell it. But: "The Perfume of Reading." A "perfume soundtrack." In the discussion, Tan Lin talks about his interest in "expanding the frame of reading to an environmental space," a space "disaggregated by fragrance." What's interesting to me about this and other comments throughout the discussion is the desire to retain a certain "bookishness" in the piece. Film brings a cinematic experience to the book, perfumes extend the space of reading a book to the broader space of a scented room. Why tag any of this work as fundamentally bibliographic? Put another way, plenty of self-described digital poetry projects verse onto a wall alongside various other media forms (audio, images). 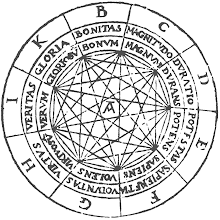 What does relating this type of work to the codex form get us? Where does it get us? 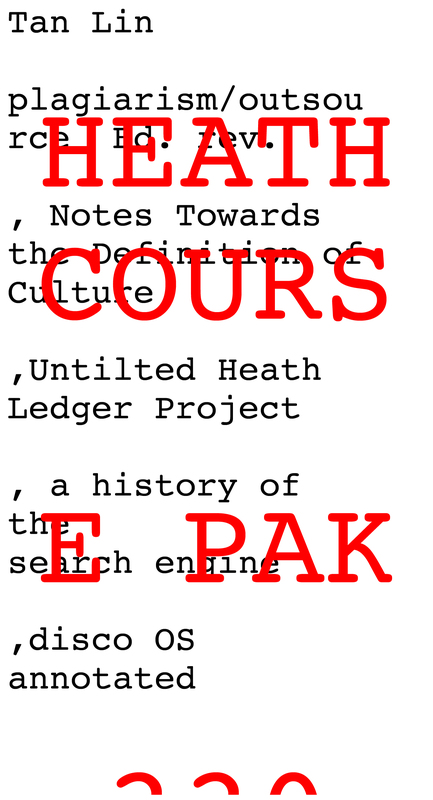 Earlier this year, Counterpath Press kindly sent me a copy of Lin's Heath Course Pak, which, if I were asked to describe it in only a handful of words, I would call one person's afternoon of 'net surfing in book form. I state that admiringly. It meanders from text to scan to image to screenshot, strung together through loose, lyrical affiliations to Heath Ledger's death or Samuel Pepys's Diary. In fact, if Samuel Pepys had had the web, he might have produced his journal something like this (a fact of which Lin is no doubt aware). Again, the question: why print and bind it as a book? Culturally, we position e-books as the "next stage" in the history of the book; but (this thought is still difficult to articulate well) to describe e-books as 'books' is to privilege content over form in the word 'book', which is another way of saying: it is far from clear to me that the most ostensibly innovative digital 'books' are still books at all. 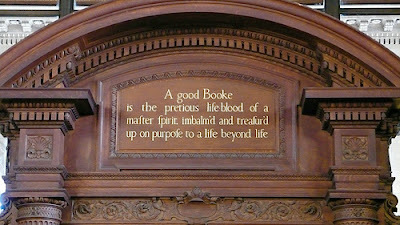 If we define books through the codex form -- rather than through some vague sense of 'long-form text-y argument-ish thing one reads in particular situations, usually while waiting or traveling' -- then digital innovation in the book means bringing other media into contact with the form and seeing how they play together, how they mediate each other. Which is exactly what Heath Course Pak does. It's a kind of inverted, perverted e-book. 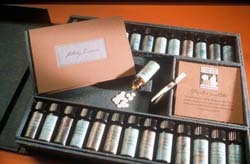 Wendy Fernstrum has produced Literary Essences, a book of vials of perfume. For Books are not absolutely dead things, but doe contain a potencie of life in them to be as active as that soule was whose progeny they are; nay they do preserve as in a violl the purest efficacie and extraction of that living intellect that bred them. Milton's use of the word ‘violl’ is interesting, since, in the Greek, it usually meant a broad, flat vessel, like a saucer; and in the Authorized Version it is still translated as a ‘bowl’. The sense of its being a small glass bottle, containing an essence, seems to have developed in the seventeenth century. I have not pursued the inquiry further but I imagine that this meaning relates to the use of glass tubes and phials in scientific experiments. Their transparency would have been important for allowing one to read the level of a liquid, as we do in a thermometer or mercury-glass, or to see chemical reactions involving, for example, changes of colour. In this rather new sense, then, as used by Milton and later by Robert Boyle, it heightens the idea of enclosure, of the text as contained, determined, stable, of the author within, both clearly visible and enduringly present. Smells, the smells of media objects, are often nostalgic, and sometimes disruptive, but rarely signal innovations. When digital technologies smell, something's wrong. Even at thy father's nose, so were we spied. // John Donne, "The Perfume"
Then there's Smell of Books™, "a revolutionary new aerosol e-book enhancer." Before you get too worked up, it was a spoof. You can tell because the product is made by DuroSport Electronics, the same company who produced the Russian iPod knock-off that Roy gets Pam for Christmas one episode on the US version of The Office. Presumably, the writers of the show made the DuroSport website as a joke, with Smell of Books™ as a quirky follow-up. The Authors Guild has recently been made aware of a new e-book related product called “Smell of Books”. This product has allegedly been designed to improve the e-book reading experience by simulating the smell of a real book. While the Authors Guild supports efforts to improve the digital reading experience, we believe this product represents a significant threat to the development of aroma rights, and as such, will adversely impact the rights of our members. It is important to note that in the digital era, books, and the smell of books, have been decoupled. In the future we expect authors to participate in the development of custom aromas for their books. These olfactory rights constitute a derivative right to be licensed separately. The preservation of these rights is essential as authors explore new markets and distribution channels. Allowing unauthorized third parties to provide the “scent” for a book substantially changes the underlying work to a degree that infringes upon the author’s copyright, not to mention artistic vision. "Have you heard about #penningperfumes also? We add a scented pen to the anthology http://penningperfumes.tumblr.com/anthology"